We're happy to have launched a new website for a long-time client. The website is for Hollenbeck-Cahill Funeral Homes in Bradford, PA. The previous version of the website which we developed several years ago, so it was time for an update! This website project started with a fresh design. Mike and Jeffrey at Hollenbeck-Cahill gave us great design feedback, which always helps the design phase move smoothly. One of the most important factors of the new design was that it had to be easy to use on a tablet or mobile device. We utilized responsive design to make that happen. 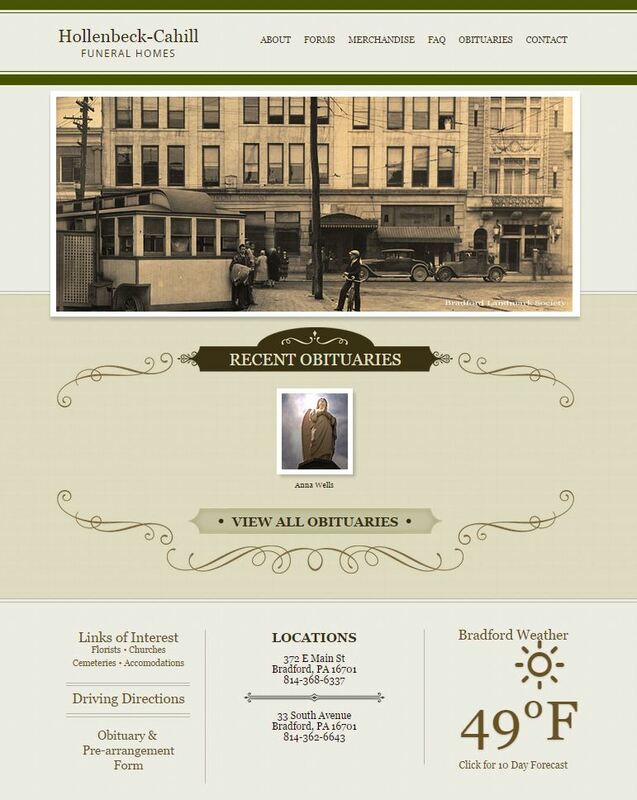 The new homepage slider uses photos from historic Bradford that were supplied by the folks at the Bradford Landmark society. The recent obituaries carousel will allow users to scroll through current obituaries when there are more than 5 live on the site. The new Hollenbeck-Cahill website utilizes the c80 Content Management System, which allows them to change the content on their site easily. To manage the online condolences and obituaries, we customized c80 so that information can be easily managed as well. Also as a new feature, online obituaries are now able to have photos of loved ones that can be added at the time the obituary is created or a family can be assigned a log in for the website, allowing them to add their own photos of their friends and families. This was a fun project. We always enjoy working with Mike and the team. Please check out the website when you have a few free minutes.